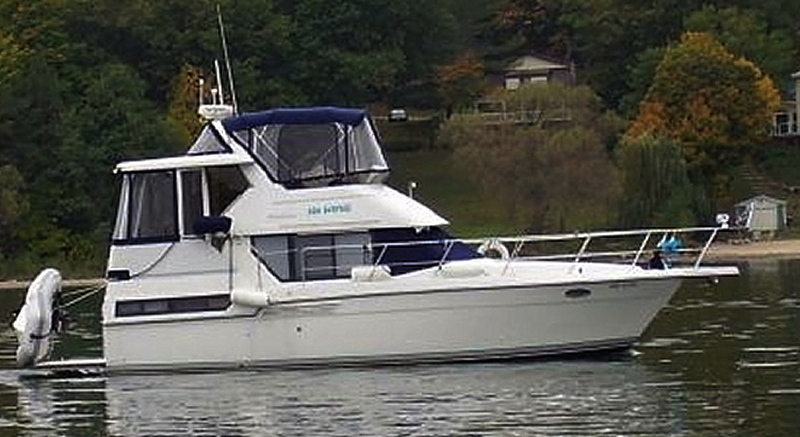 The 350 Aft Cabin Motor Yacht (formerly the 33MY in 1991-92) was one of Carver’s most popular aft cabins with two private staterooms and two head compartments with showers. With plenty of on-board conveniences, it’s a great choice for live-aboard or extended cruising. The boat features a teak-accented main salon with comfortable seating and large, wrap-around windows for great visibility and bright, natural lighting. The galley is well equipped with a newer full-size fridge/freezer, 3-burner stove and oven. This freshwater 350 comes with the optional hardtop and electronics arch, full bridge and aft deck enclosures, and an unobtrusive lower helm station. Coupled with highly regarded Carver build quality, this is one of the best pre-owned cruising values on the water. Located off-site – please call in advance to book an appointment.